Seamus Coleman: The Story so far…. Seamus Coleman has been one of the star turns in what has been an up and down season for the Blues so far. His speed, fearless approach and raw ability have been refreshing to watch and has led David Moyes to propose that the Irishman can have the same impact for us as Gareth Bale has done for Spurs, which is some praise considering Bale is held up as the benchmark for young wide players in the Premier League. This article will assess his performance this season and will look to where he fits in with Everton’s future setup and also analyse if the stats support Moyes’ comparison between Coleman and Bale. 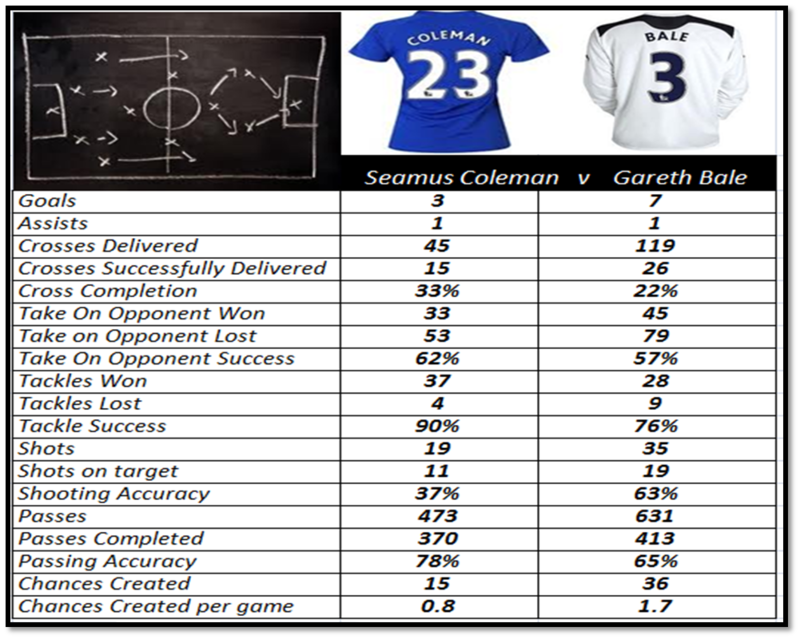 Coleman’s stats summary this season……. Coleman is statistically our best tackler this season with a completion rate of 90%. His pass completion rate is an impressive 78% although his shooting requires some improvement, currently only accurate with 1 in 3 shots. His ability to take players on has been a key component to his success, with an impressive 62% success rate of beating his marker and 33% of his crosses have been completed successfully, with a classic example of both being the below mazy run and cross against Liverpool to setup Cahill’s opening goal. I have made the point on this blog in the past that Moyes has a preference for wide players to tuck inside (like Pienaar,Arteta, Billy) to enable the fullback to get up the flank and create an extra man in midfield (like Baines does week in week out). Playing right wing, Coleman doesn’t really fit into this model because he likes to hug the touchline due to him being a born and bred fullback. Coleman is doing a fantastic job for the team this year and his speed, penetration and direct approach are qualities that we don’t have in abundance in the current squad. Pace is such a key variable in the modern game and with Coleman in our midfield it is noticeable that defenders will stand off more and hold a deeper defensive line to prevent the threat in behind. This in turn creates more space on the field for us to exploit. 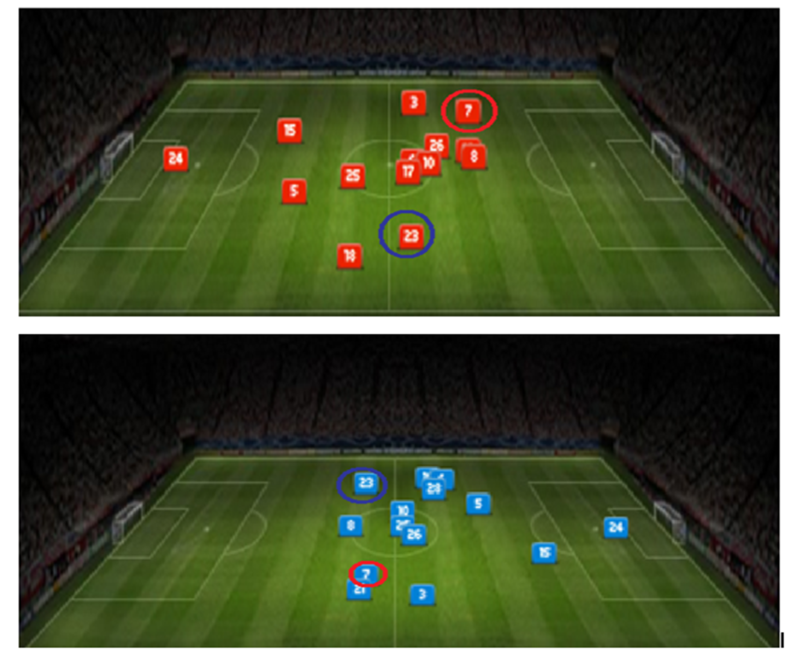 The diagram shows Coleman’s average position from a recent home and away game. The top diagram shows Coleman (circled blue) much more withdrawn than Billy (circled red) on the opposite flank. The below diagram shows his and Billy’s average positions against Arsenal with Coleman clearly further forward and almost level with Saha. This has been a trend in many games this term where Coleman’s pace has been better utilized more in away games were home defenders will push up more leaving space in behind which is perhaps why out of Coleman’s 5 goals in all competitions, 4 have come on our travels. There are definitely comparisons which can be drawn between both of these all action players. Both are comfortable as full backs but are currently deployed as wingers for their clubs. Also, unlike the modern trend to play wingers on the opposite wing cutting in on their preferred foot (e.g. Ashley Young for Aston Villa) they both play on their strongest footing side, Bale on the left and Coleman on the right. 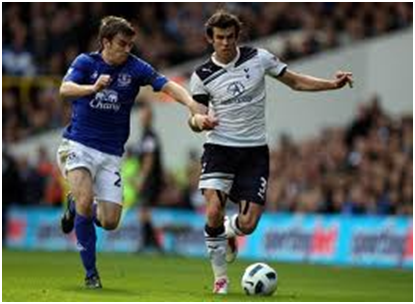 For me, Seamus Coleman has much better defensive attributes than Bale. If you look at Coleman’s tackling stats (90% completion) you can see he is a natural stopper and loves to tackle. Coleman has also shown in his man marking assignments this campaign (notably on Ashley Cole at Stamford Bridge) that he is adept in tracking and nullifying opponents. Bale is more composed and has a better chance creation and shooting completion figure. Bale on average creates 1.7 Chances per game for an opponent whilst Coleman has a much lower figure of 0.8. I would say that Coleman is a real goal threat when it comes to instinct (4 of his 5 goals this campaign have been 1 touch finishes) but he can often show indecision when given too much time and space in the final third as happened in the second half of the Blackpool game at the weekend. Both will often look to hit the touchline before delivering although Bale, like Leighton Baines, has a range of delivery which means he is capable of whipping/drilling balls from deeper positions. One thing which is interesting to note is that from combined they have put in164 crosses with only 41 reaching an opponent. Paul Gardner’s recent article in World Soccer Magazine talked about how in modern football the cross into the box is something of a haphazard tactic with figures showing that it has limited success in terms of creating goals. He comments that other leagues such as La Liga have a significantly less emphasis on the cross as a way of creating a goal scoring opportunity, with the games he analysed showing 3 times less crosses in the Spanish games than in the Premier League. With our skipper Phil Neville perhaps having 1-2 years left as a pro I foresee Moyes increasingly looking to use Coleman in the right back slot. When he has been deployed here this season (albeit sparingly) he has shown that he can switch off (See below screen shot v Newcastle ) and also being caught up field against Brentford for their goal. 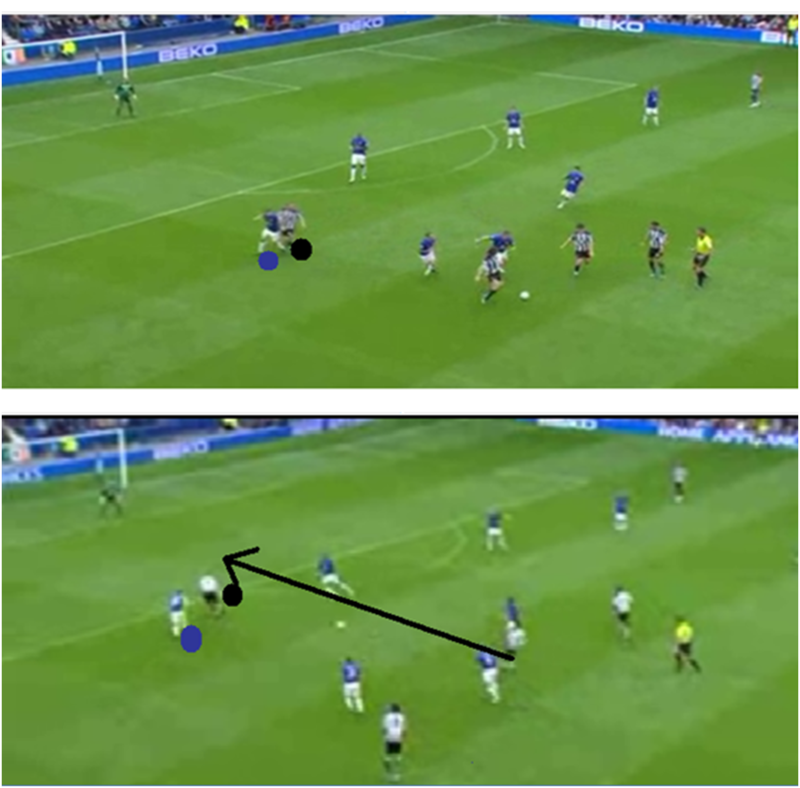 v Newcastle at Goodison earlier this season, SC switches off when in the right back role enabling Kevin Nolan to find space leading to SC bringing Nolan down which luckily for the Blues didn’t result in a pen. This occasional lack of awareness is something which is resolved through experience and playing in front of Phil Neville week in week out will unquestionably benefit the Irishman in terms of advice and guidance from the skipper on when to go and when to hold position. If you look at the current composition of our squad, I would say our best central players are midfielders (Arteta, Rodwell, Fellaini) and our best wide players are defenders (Baines, Coleman). Therefore an approach similar to AC Milan’s current 4-3-1-2 system could be deployed. 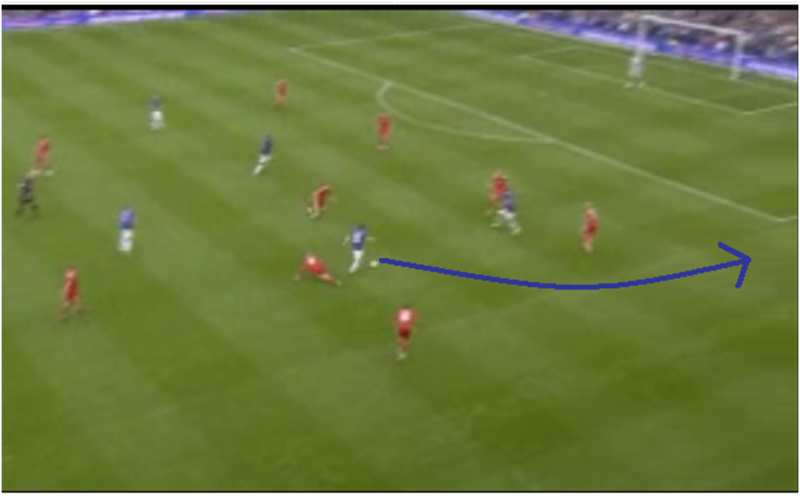 The additional benefit of this approach would be to have 2 out and out strikers with Cahill in behind. Mikel Arteta is a player whose career I have followed closely since signing him from Barcelona on Championship Manager to his time on loan at PSG and during positive and negative spells in Glasgow and Sociedad. His arrival at Goodison was a pivotal moment in Everton’s recent history and was a catalyst in changing the style of football we play. This article tells the story of Arteta’s career, investigates the roles he has been deployed in and the impact he has made in terms of style and results during his time at L4. I am a big fan of Arteta but I have tried to be as objective as possible in writing this piece and in terms of the statistics used to supplement various arguments. Following 2 productive years at Glasgow Rangers where he built on this new found attacking freedom yielding 14 goals in the process, he made the switch back to Spain with Sociedad. It was to be a disappointing spell though as the club employed Jose Amorrortu, Arteta’s former coach at Bilbao as a youth. His new mentor still held a grudge about Arteta’s defection to Barca’s Academy and froze Arteta out of the first team picture , prompting his exit to Goodison. Initially used by David Moyes in his natural position in the central of midfield he quickly became a key cog in arresting our decline after an amazing start to the season had hit the buffers with Thomas Gravesen’s departure to Real Mardid. With him in midfield, we were able to maintain possession better and claim key victories, notably over Manchester United when Arteta played a deliciously whipped free kick for Duncan Ferguson to grab the winner and see us into the Champions League Qualifiers. David Moyes had doubts about his strength to cope with the brutality of some of the Premier League’s hatchet men given his 11st frame and deployed him on the wing from the 2005/6 season. Arteta would occupy a wide brief for the next 3 seasons. It was a role Arteta was comfortable with, often playing as a ‘ghost winger’ cutting in from the right to create chances and score with great regularity. 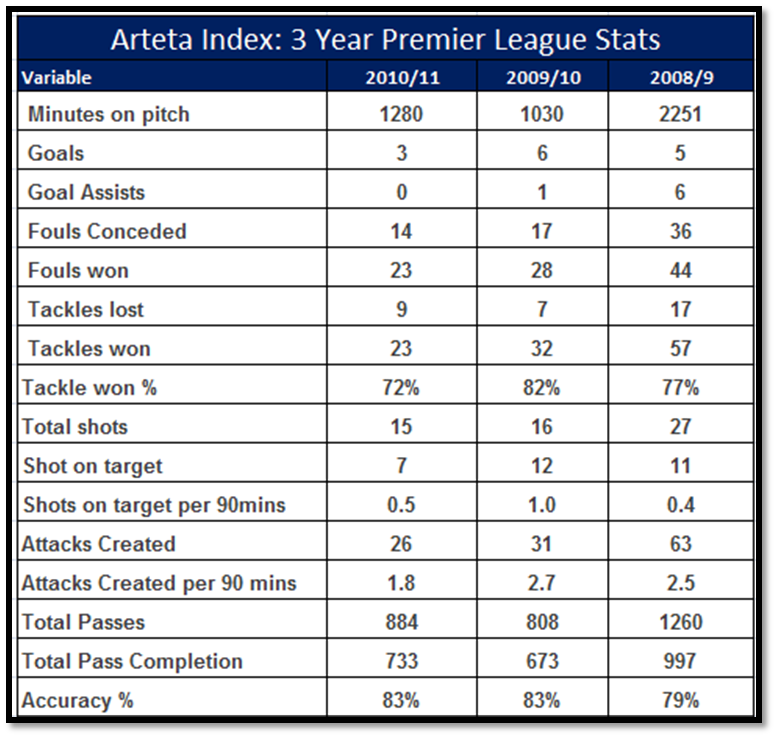 Indeed, the 2006/7 season was to be Arteta’s most productive with 9 goals and 13 assists representing a great return. Arteta was no longer a secret in the Premier League and the following campaign was to see him as a marked man, resulting in him taking the dubious honour of being the most fouled player in the league, fouled every 28.8 minutes in season 2007/8. It was another productive campaign though, with an average of 11 crosses per game giving him the second highest cross per game ratio in the league. The close season was to provide a key moment in Arteta’s positional shift at Everton, with Lee Carsley leaving the club the role of midfield anchor was available. Moyes tried various players in the role during a haphazard start to the campaign but non carried the control and heartbeat which Everton required. It was only after an injury crisis that Arteta was shifted inside at Spurs in October that he got his opportunity to prove to Moyes that he was capable of filling this role. It is a role he is more than capable of being deployed into. In this role he dictates the way Everton play and provides great technique, controlled passing, positional strength and the ability to pass and press accompanied by decent pace. The role is more restrictive and requires greater defensive awareness which is something which comes natural to Arteta due to the tuition he received from Guardiola. Playing in the holding midfield role does provide a restriction to someone of Arteta’s ability going forward. This was evident in season 2008/9 and can be seen by the stats which show that despite still slotting 6 goals from his new central position, the bulk of these where from deadball positions and he had 50% less shots on goal than he had from the previous season when deployed on the flanks cutting inside. The central position he occupies does see him much more involved in the play though, as demonstrated in the Chalkboard analysis above comparing when he plays in a right sided role and from the centre. 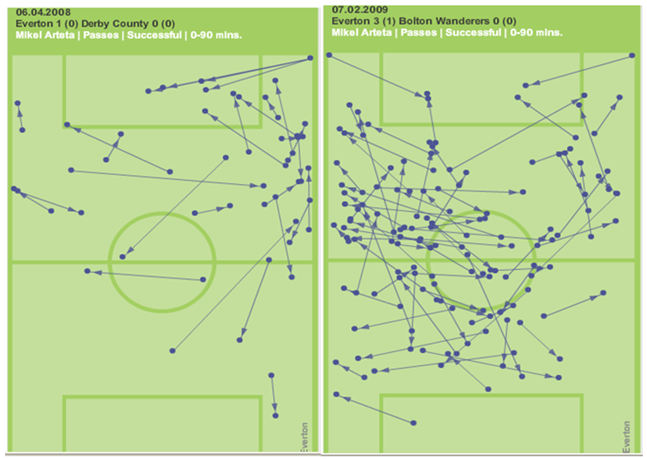 In the above games when playing out wide he misfired 23 of his 55 passes in contrast to the following season 2008/9 against Bolton playing centrally were he accurately shifted 72 of his 86 passes. The below Chalkboard’s show his passing heatmap comparison from the 2008/9 season and the 2010/11 campaign. Notice how in the 2008/9 heatmap he distributes just 10% of his passes in the final third and is heavily involved from a defensive point of view, completing 8 out of 10 of his tackles. If you compare this to the chalkboard (below right) from our most reason game against Spurs he is much more offensive and his % goes up to 41% in the final third. In season 2008/9 Arteta really flexed his muscle as Everton’s centre midfield hub, and he was instrumental in the Blues surge to 5th place in the league table and the FA Cup Final against Chelsea. In a cruel twist of fate his campaign ended prematurely in March as injury would rule him out for almost a year. Regular’s at Goodison will concur that in the remaining games of this campaign and during the start of the following season Everton’s approach was much more route one because of his absence. Chalkboard Analysis 2008-9 v 2010-11 Season Far Left Shows defensive midfield role v Man City and high volume of tackles. Middle board shows passing heatmap in same season and far right from this season. Notice this season he is playing in a more advanced midfield role. Since his return from injury in the 2009/10 season, Arteta has played as a more orthodox central midfielder with an anchor behind him and an attacking midfielder in front of him. The Spaniard is fundamental to the Everton strategy towards games. With him, they will dominate possession and play a controlled passing game, playing high up the pitch often drawing numerous free kicks around the opposition area. Without him we will adopt a much more direct approach. This is shown in the below chalkboard from Everton’s game at West Ham this season with Arteta and the corresponding fixture last season without the Spaniard schemer. With him Everton made 429 passes while without him they registered just 246. Another interesting statistic to note between these games with and without Arteta is that goalkeeper Tim Howard’s kicking is noticeably more direct in these fixtures, with him punting 100% more long kicks out of play in the fixture Arteta was absent compared to the corresponding game. The conclusion we can draw here is that with him in the side, Everton play from the back and into midfield whilst without him there is a greater emphasis to get the ball forward quickly. As discussed in this article Arteta provides a good barometer of how Everton play with his appearance directly affecting the level of possession Everton accrue in games. A look at the table below shows how vital he is to the Blue cause. 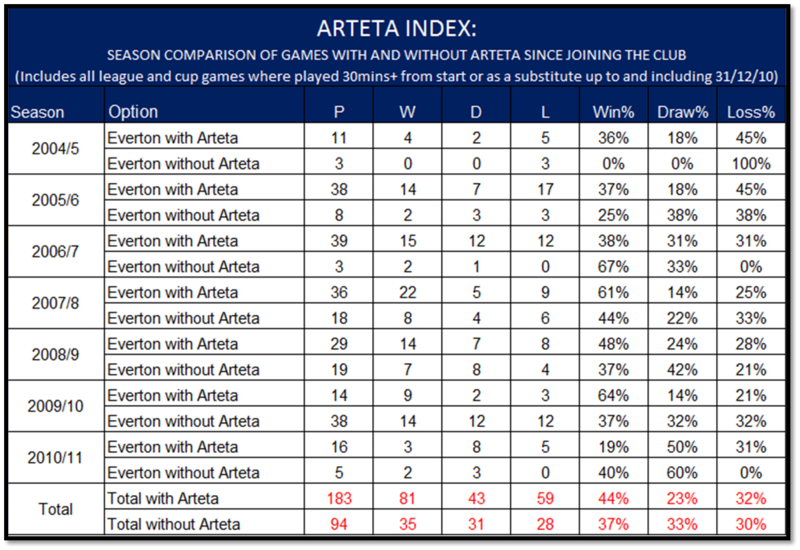 Notice the direct correlation between the games Arteta appears and the outcomes of games season by season. The clearest representation of this is the Blues win percentage is 44% with him in the side and just 37% with him not in the side. There has been disillusionment this campaign from the Blues faithful on Arteta’s output and this blog has reported on how often a lot of his passes this campaign have lacked penetration. Indeed, in the games Arteta has missed this campaign the Blues have more than held their own. This needs to be balanced by the fact that opponents will always look to press him more in possession than for example his central midfield partner whether that be Heitinga or Fellaini. This season has been a disappointing one thus far for Everton’s number ten. The 3year table at the start of this article illustrates this point perfectly in that his tackle completion, chances created per 90 minutes and shots on target ratio’s are all down on previous season figures although his passing accuracy continues to be steady on 83%. With a new contract signed it will be interesting to see where David Moyes sees Arteta fitting in for the following years. 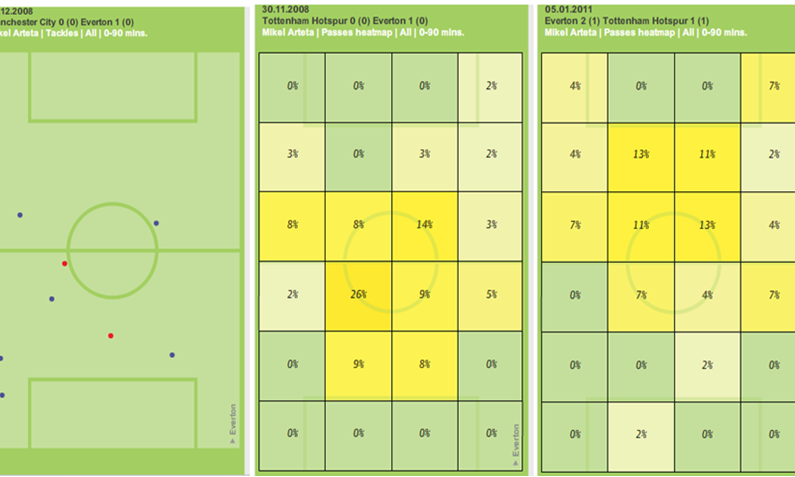 With Jack Rodwell knocking on the door for a regular spot in central midfield and Steven Pienaar’s much expected departure it would leave Everton with an unbalanced midfield top heavy in central midfield but weak on the flanks. With no money in the Goodison coffers it could be that Arteta is switched out to the flanks where of course he enjoyed his most productive campaign output wise in the 2006/7 campaign. Whatever the future holds, the diminutive Spaniard has been a tremendous servant to the club and it is a pleasure to watch him on his game.